Resume for David Inlow, S.E. 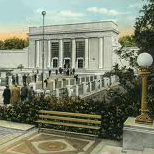 Leading up to the replacement of the Steinhart Aquarium with the more recent California Academy of Sciences was the realization that the old aquarium building was unacceptably vernerable to strong earthquake shaking. Circa 1990, an engineering assessment including a probabilistic analysis indicated that the building could benefit from an interim seismic improvement scheme that could prolong its life to the point that a replacement building could take its place. At the time it was not known when a replacement building would be in place. Seismic strengthening was accomplished using structural bracing. The bracing was architecturally exposed in places. David Inlow S.E. gratefully acknowledges the engineer of record and fellow staff for their collaborative contributions to this project.